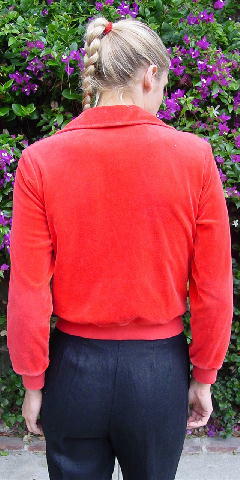 This orange-red velour has a Peter Pan type collar and long sleeves with 2" ribbed cuffs. There is a top to bottom front zipper and a 2" wide ribbed waistband. It has 2 side seam front pockets in a quarter shape. Each side has three white diagonal cord accents. It's a great color and nice, soft fabric. armpit to armpit 18 1/4"